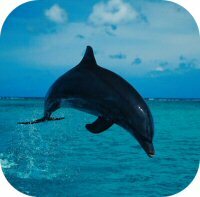 Humans are known as involuntary breathers, while dolphins are classified as voluntary breathers. Humans do not have to think about breathing, they just do it. Dolphins on the other hand, have to think about every breath that they take. Now you might be wondering how dolphins are able to rest, and continue to breathe. Dolphins sleep with only half of their brain at a time. They sleep with one eye open to look for predators while also staying alert enough to take a breath when required. In this way, the animal is never completely unconscious, but they are still able to get the rest that they need.